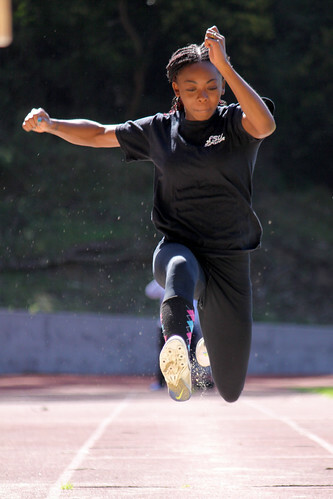 SF State's Keenya McDaniel, practices triple jump in Cox Stadium, Mar. 6, 2012. McDaniel will represent SF State in this year's NCAA Division II Indoor Championships in Minnesota. Photo by Hang Cheng. Whether they propel a metal ball or their bodies through the air, three track and field athletes have managed to excel to the highest level of collegiate competition. Sophomore Keenya McDaniel and seniors Meagen Moiola and Luisa Musika represented SF State in three events at the National Collegiate Athletic Association Division II Indoor Track and Field Championships last week in Mankato, Minn. The athletes share the goal of placing top eight for All-American status, an honorary feat only a handful of past athletes of accomplished. For seniors Moiola and Musika, the championship marks the final days of their careers as SF State athletes; for McDaniel the event highlights the start of a promising career. The program is on the rise due to trio’s performance in the indoor championship, as well as the seven student athletes who were named to the NCAA Division II All-West Region women’s indoor track and field team this season. The team placed 22 out of 50, a standing that has increased their expectations for the future. McDaniel’s school-wide record-breaking leap of 40 feet 2 inches in the triple jump earned her third place and an All-American title at the championship. She broke her own school record of 39 feet 5 3/4 inches set Feb. 4 of this year at the New Mexico Classic. Moiola cleared 5 feet 6 1/2 inches in the high jump, but barely missed the cut to become an All-American after her performance notched her ninth place in the competition. “It was a good experience for her. She’s never been to a national championship meet,” said head coach Terry Burke. Nagging injuries slowed down Musika in the shot put. Despite a sore ankle, she managed to throw for 42 feet 6 3/4 inches, which earned her 12th place. Musika refused to use her injuries as an excuse. “I never really had to deal with injuries before. I definitely should have been more safe and taped up my ankle before I competed, but you live and you learn,” Musika said. Although Moiola and Musika came up short of their All-American goal, the experience bodes well for them in their final outdoor meets. The three athletes will look to put the events from the indoor championships behind them and use their experience for the NCAA Division II Outdoor National Championships, which are more than a month away. McDaniel’s early success has ensured a promising career at SF State in the coming years. After her predictions about the nationals came to fruition, her confidence is at an all-time high and she feels better prepared for upcoming seasons. “I’m enjoying it. I feel like it’s an advantage to start off earlier so hopefully by my senior year I’m amazing and I’ll be used to competing at a higher level,” McDaniel said. While McDaniel was relishing the moment of her first indoor nationals, Musika was not looking for enjoyment from the competition. With three outdoor national competitions under her belt, she prepared for the level of competition that awaited the Gators. Musika, in her final year of competition, is looking forward to finishing off her senior year with a bang by succeeding in the outdoor competitions. Moiola is also looking to do something big in her final season with the team. Through unfaltering motivation, she has used the indoor competitions as a learning experience and preparation for the upcoming events. “Success motivates me. Doing well makes me want to do even better. The meets where you surpass what you expected is more motivation to keep going,” Miola said. Burke aims to take it easy on the athletes in practice in order to recover before the outdoor championship. McDaniel, however, has other plans in mind. 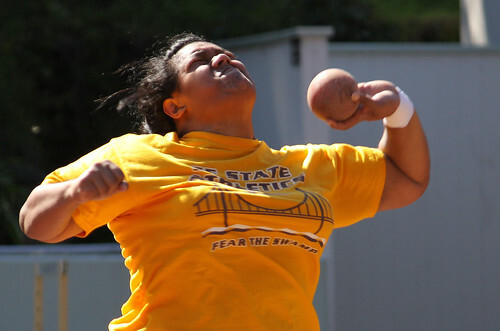 SF State's Luisa Musika, practices shot-put in Cox Stadium, Mar. 6, 2012. Musika will represent SF State in this year's NCAA Division II Indoor Championships in Minnesota. Photo by Hang Cheng.